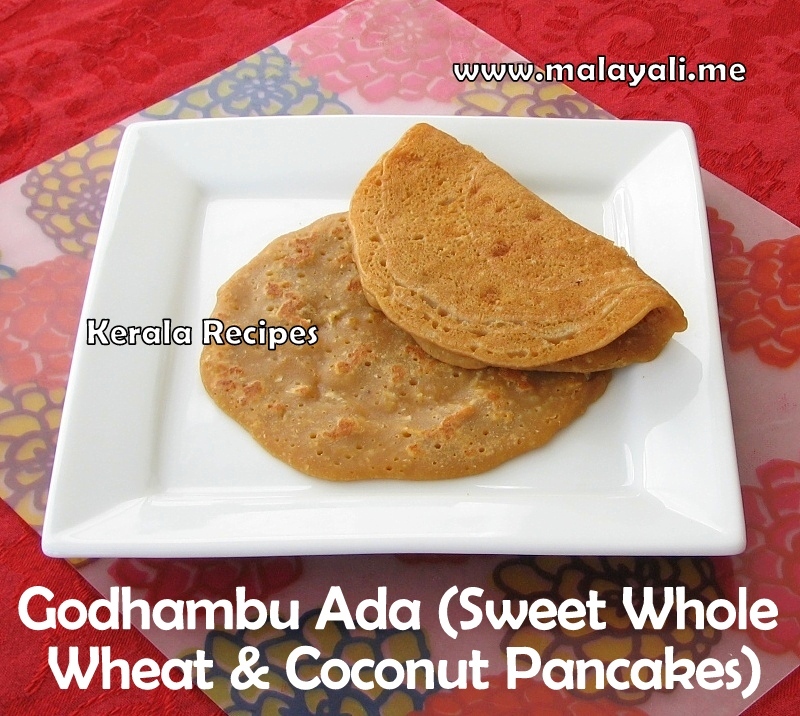 Recently, while visiting one of my cousins, she made this sweet Godhambu Ada for breakfast. I was hooked on it instantly. The sheer simplicity of the recipe compelled me to try these sweet Whole Wheat and Coconut Pancakes at home. My husband likes these pancakes and he remembers eating it as a child whenever he visited relatives in Kerala. You can make these for breakfast or as a tea-time snack or even a quick dinner. Heat 1 and 3/4 cups water in a pan and add the powdered jaggery. Stir and allow it to melt completely to form a syrup. Combine wheat flour, grated coconut, salt and powdered cardamom in a bowl. Add the melted jaggery syrup to the bowl and mix everything with a spoon to form a batter. The batter should have a pouring consistency but shouldn’t be runny. Heat a non stick frying pan or tava. Pour a few ladles of batter and spread to form a circular disc. Cover and cook the ada on medium heat for 2-3 minutes. Flip with a spatula and cook the other side until lightly browned. You can make 4-5 pancakes using the above quantities. You can also use brown sugar instead of jaggery. You may have to add more or less water for the batter depending on the wheat flour used. If the batter is watery, the pancakes will stick to the pan. If it is too thick, you will have difficulty spreading the batter. When we were kids, my mom used to make this for us a Naalu Mani Palahaaram. Thanks for sharing. simple and easy recipe… kids liked it..